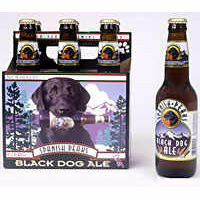 BLACK DOG ALE brewed at Spanish Peaks Brewery in Montana. Very mild taste. Not too harsh or too bitter. An English style special amber ale. This ale's full body imparts a distinctive malty, robust palate and fruity bouquet. Brewed from pale malted barley, Munich, crystal, carastan and a touch of chocolate malts, Pacific Northwest hops, water and ale yeast.